When kitchen design mistakes happen, it can lead to frustration and aggravation. A kitchen renovation is a huge and expensive undertaking. Between picking out new cabinets to new backsplash, it can be a stressful time as well. Stress can lead to oversight because you want your kitchen back. This is where the kitchen design mistakes can happen. I’m covering the five common kitchen design mistakes and how you can avoid them. This is bigger common kitchen design mistake than you would think. If you overthink it, you end up with wasted space and storage. This might not be a huge issue, but if space is an issue, it can be. If you underthink it, you’re left without storage and organization. Islands are great in kitchens. They provide extra workspace and storage. Yet, a wrong sized island can disrupt a kitchen’s flow. An oversized island in a small space can be overbearing and ineffective. Having all that extra workspace means nothing if you can’t move in your kitchen. Yet, an undersized island becomes more of a hazard than a helper. The best way to avoid this mistake is to think about how you use your kitchen. Ask yourself do you cook a lot? Do you like to entertain? Is the kitchen the main hub for the entertainment? Is storage already an issue? Take the time to think about how you use your kitchen now and how you hope to use it after the renovation. Be reasonable when thinking about an island. Not every kitchen can have one. Should you choose to have one, be smart about it. Measure twice. Also, use painter’s tape to mark out where the island will be. You’ll be able to visualize where the island will be and how it will affect your traffic and Work Triangle. If it affects it too much, a kitchen island isn’t for you. The Work Triangle is the heart of your kitchen. The Work Triangle consists of three points: the refrigerator, the sink, and the cooktop. 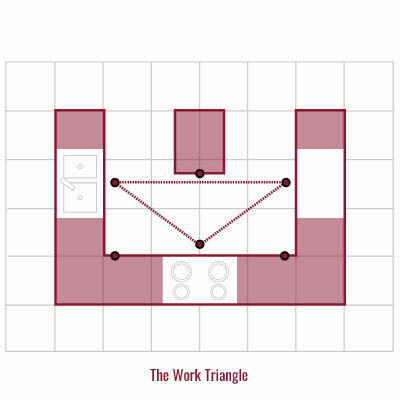 If you forget about the Work Triangle, you can have a kitchen that doesn’t flow the way you need it to. By following these guidelines, your kitchen will have a nice, workable flow. You can also avoid another kitchen design mistake: cabinets that open into each other. You’ve made a mistake if two cabinets can’t both be open. For information on the Work Triangle, download our Plan Your Kitchen eBook. This is a common kitchen design mistake. A headache happens when homeowners buy cabinets before their appliances. You may be stuck buying an appliance that’s too small for your needs. Avoid this headache by getting your appliances first. Once you have them, get measurements for your kitchen designer. It’s far easier to design a kitchen around your appliances than vice versa. Cabinets are the most expensive item in your kitchen renovation. According to HGTV.com, they can make up to 35% of your renovation budget. That’s a huge chunk of change for cheap cabinets. Homeowners can have sticker shock when looking at cabinets. This may lead them to go with the cheaper option. A cheaper cabinet will need repairs or replaced compared to a quality-built cabinet. A quality-built cabinet will last for years and years to come. Consider the building materials used and look for the KCMA Approved sticker. Our cabinets use furniture-grade plywood and pocket screw joinery. For more information on our construction, check out our “Quality of Construction” page. You’ve set the budget and the renovation is moving along. That’s until your contractor recommends replacing your out-of-date plumbing. Or when picking out appliances, you pick the high-end, smart screen, Alexa-connected refrigerator. With any renovation project, there’s only so much that you can plan for. Consider giving yourself some cushion. Most home improvement sites recommend a cushion between 10-20% of your budget. Should your renovation stay in or under budget, spring for that smart refrigerator. To get started on your renovation budget, download our Renovation Budget Workbook. A kitchen renovation is stressful enough. Once it’s over, you shouldn’t still be stressing. Before any renovation project, take the time to plan and budget. Develop a wants versus needs lists. Measure to see if your dream kitchen is doable. It’s better to find solutions beforehand than in the middle of the renovation. Think I missed something? Let me know in the comments below!